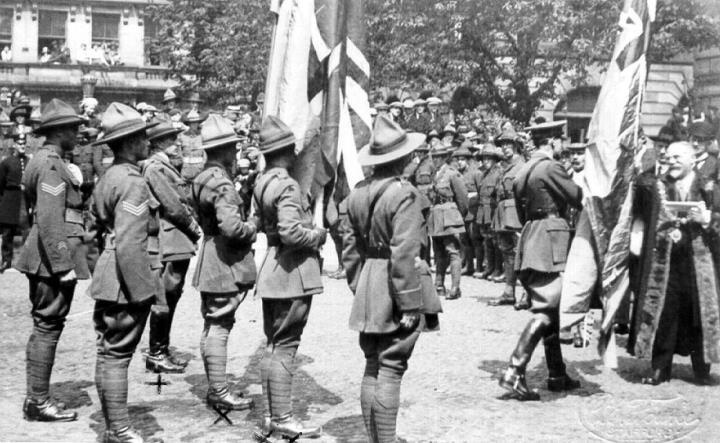 With Anzac Day fast approaching researchers are hoping to locate two missing flags presented to the New Zealand Rifle Brigade in England in 1919 and are looking for help from the public. “The flags were presented at the end of the First World War when the brigade left Brocton Camp at Cannock Chase, and a farewell parade was held through the streets of Stafford on 10 May 1919,” says Neill Atkinson, Chief Historian, Ministry for Culture and Heritage. At the end of the First World War, when the New Zealand Rifle Brigade left the military camps on Cannock Chase, they held a farewell parade through the streets of Stafford. Reproduced with the permission of the Staffordshire Record Office. View a larger image here. “The flags, a Union Jack and a silk New Zealand Ensign, were presented by Mayor Joseph Rushton at Market Square. In return, a New Zealand flag was given to the town by Lieutenant Colonel N. F. Shepherd and initially kept at St Mary’s Church in Stafford. Here the Mayor is presenting the troops with a Union Jack and the New Zealand Ensign on Market Square. 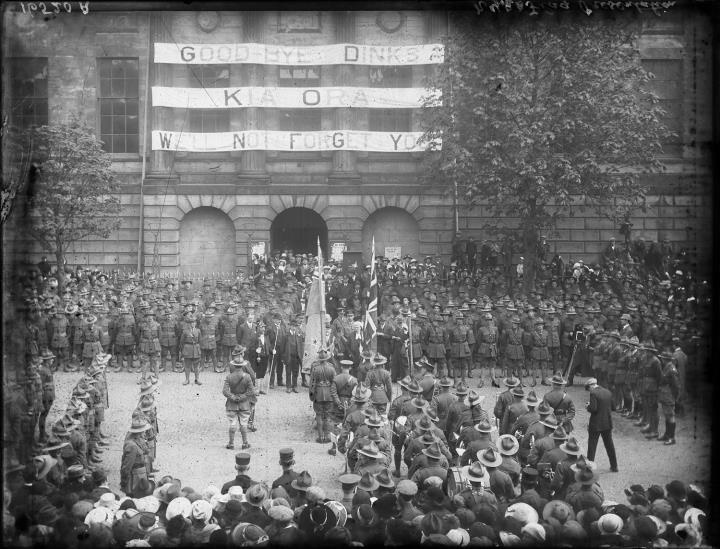 The parade then marched to Seimens' sports field where the soldiers took part in sports events, watched by members of the public. Reproduced with the permission of the Staffordshire Record Office. View a larger image here. “In New Zealand the flags were reportedly used at military funerals. Later, to mark the 21st anniversary of the brigade, the flags were handed over to the National War Memorial Committee in October 1936. Members of the committee included Lt Col A. Cowles, Councillor H.A.R. Huggins, E.E. Muir, E.C. Hale, Robert Johnson, J. H. Hallewell and J.G. Osborne. “During the last few years, researchers in New Zealand and England have tried to locate the two flags and a film recording of the 1919 ceremony. 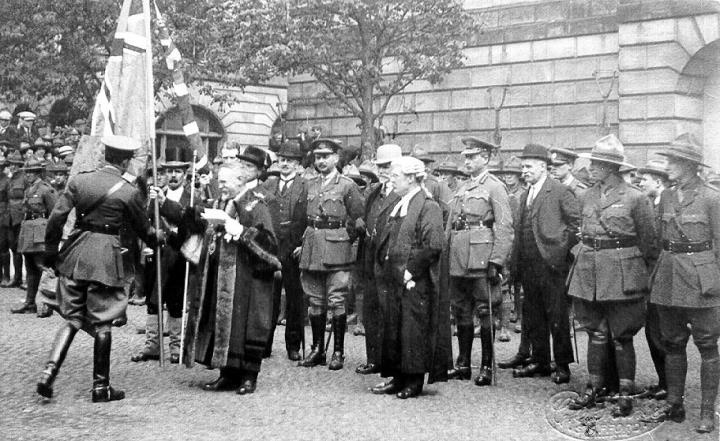 Another image of Mayor Joseph Rushton presenting the troops with a Union Jack and the New Zealand Ensign on Market Square. Reproduced with the permission of the Staffordshire Record Office. View a larger image here. Neill Atkinson says a number of strong connections remain today. These include a Stafford shield given to the brigade and held at Linton Army Camp which is contested annually by the New Zealand Army. And the National Army Museum in Waiouru holds the dog collar of Freda, a Harlequin Great Dane who was the brigade’s faithful mascot. Freda died in 1918 and is buried at Brocton Camp. “New Zealand researcher Geoff McMillan, nephew of Rifleman Charles McMillan, one of the 73 buried at Cannock Chase, was unaware of his family’s connection until he inherited letters from his grandmother,” Neill Atkinson says. “These letters included correspondence from Maud Levett, a British woman whose own son died on the Somme. Maud Levett adopted Rifleman McMillan’s grave, suggesting types of seeds to send over and providing a water colour drawing of the grave with the original wooden headstone. “Geoff McMillian attended the Cannock Chase Anzac Day commemorations in 2015 and met with Staffordshire historians also searching for the current whereabouts of these items. “It’s nearly 100 years on and the lack of documentation along with the reality that the flags may have disintegrated or not be distinguishable from the hundreds of flags that arrived back in New Zealand, creates a number of challenges. “However, we are optimistic,” Neill Atkinson said. Anyone who can help locate the missing flags can send information to the Ministry at: info@mch.govt.nz and to Geoff McMillian at: geoffmcmillan8@gmail.com. During the First World War there was a large military camp at Cannock Chase which became the base for the New Zealand Rifle Brigade. The camp included a prisoner-of-war hospital with 1000 beds, and both the camp and hospital used the adjacent burial ground. Cannock Chase War Cemetery contains 97 Commonwealth burials of the First World War, most of them New Zealanders, as well as 286 German burials. Following the Market Square ceremony in 1919, the parade then marched to Seimens' sports field where the soldiers took part in sports events. Watched by members of the public the soldiers competed for a shield which cost approximately 60 pounds to make in 1919. A film recording of the 1919 ceremony was made by Mr T.J. Everton of Picture House, a representative of Gaumont Ltd. At least two copies were presented to New Zealand and British authorities – the Stafford canister was located, but found empty. Maud Levett, a writer on religious and spiritual topics, published several books, as well as a memoir about her son Lieutenant Levett, an Eton graduate, who was wounded twice before being killed in France in the First World War. Freda, the faithful mascot of the 5th Battalion, New Zealand Rifle Brigade, would take part in parades and was a familiar sight around the Brocton Camp. Freda succumbed to disease in December 1918 and was buried at the camp.